Crossing plants of the same species but different ploidies can have dramatic effects on seed growth, but little is known about the alterations to transcriptional programmes responsible for this. Parental genomic imbalance particularly affects proliferation of the endosperm, with an increased ratio of paternally to maternally contributed genomes ('paternal excess') associated with overproliferation, while maternal excess inhibits endosperm growth. One interpretation is that interploidy crosses disrupt the balance in the seed of active copies of parentally imprinted genes. This is supported by the observation that mutations in imprinted FIS-class genes of Arabidopsis thaliana share many features of the paternal excess phenotype. Here we investigated gene expression underlying parent-of-origin effects in Arabidopsis through transcriptional profiling of siliques generated by interploidy crosses and FIS-class mutants. We found that fertilized fis1 mutant seeds have similar profiles to seeds with paternal excess, showing that the shared phenotypes are underpinned by similar patterns of gene expression. We identified genes strongly associated with enhanced or inhibited seed growth; this provided many candidates for further investigation including MADS-box transcription factors, cell cycle genes, and genes involved in hormone pathways. The work presented here is a step towards understanding the effects on seed development of the related phenomena of parental genome balance and imprinting. Crossing plants of the same species but different ploidies often alters seed development, generating reciprocal phenotypes depending on the direction of the cross . Particularly dramatic effects are seen in endosperm, a fertilization product derived from the diploid central cell and a haploid sperm that transfers nutrients from the seed parent to the developing or germinating embryo. In general, an increased ratio of paternally to maternally contributed genomes in the seed ('paternal excess')--generated for example by crossing a diploid seed parent with a tetraploid pollen parent--is associated with increased growth of endosperm, while an increased ratio of maternal to paternal genomes ('maternal excess') inhibits endosperm growth. A widely accepted interpretation of interploidy cross phenotypes is that they disrupt the balance in the seed of active copies of parentally imprinted genes, which, depending on the particular gene, are expressed from only the maternal or only the paternal alleles [1, 2]. Study of imprinting in plants has focused on two model species, Arabidopsis thaliana and Zea mays; in both, parent-specific expression of imprinted genes is largely or exclusively confined to endosperm, with expression generally either biallelic or absent in the embryo [3–12]. To date, MATERNALLY EXPRESSED IN EMBRYO (MEE1) is the only known gene that is monoallelically expressed in the embryo . In Arabidopsis, crosses between diploid and tetraploid plants often produce viable triploid embryos, with 2xX4x crosses (diploid seed parent and tetraploid pollen parent) generating heavy seeds containing large embryos, and 4xX2x crosses producing light seeds with small embryos . 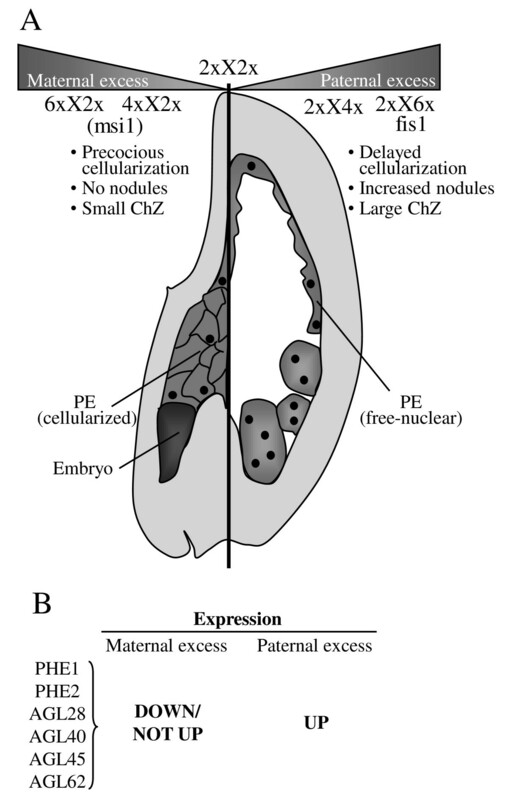 Paternal excess is associated with increased and prolonged proliferation of the endosperm, overgrowth of the chalazal endosperm and associated nodules, an abnormally large seed cavity, and delay in endosperm cellularization (normal endosperm development in Arabidopsis is described by Olsen, ), while maternal excess is characterized by inhibited endosperm division, small chalazal endosperm, absence of nodules, small seed cavity, and precocious cellularization and mitotic arrest of endosperm. Therefore the extent of endosperm growth is an important component in the final size of the seed and embryo even in a species with only one cell layer of endosperm remaining in the mature seed. Reciprocal crosses between diploid and hexaploid Arabidopsis plants produce more extreme versions of these phenotypes, and this level of parental genomic imbalance is also lethal: embryos arrest by heart stage, and the seeds abort. In maize, crosses between diploid and tetraploid plants usually result in seed abortion , but before this occurs, the developing seeds also display reciprocal phenotypes, with delayed endoreduplication (i.e. delayed differentiation) observed in kernels with paternal excess, and early mitotic arrest when there is maternal excess . In Arabidopsis, a maternal mutation in any one of four 'FIS-class' genes--FERTILIZATION INDEPENDENT SEED 1 (FIS1)/MEDEA (MEA), FIS2, FIS3/FERTILIZATION INDEPENDENT ENDOSPERM (FIE), or MULTICOPY SUPPRESSOR OF IRA 1 (MSI1)--leads to seed abortion, with phenotypes including overexpansion of the seed cavity, failure of endosperm cellularization, large chalazal endosperm and nodules, and arrest of embryos around heart stage [18–22]. Intriguingly, these phenotypes are very similar to those resulting from interploidy crosses that generate a lethal level of paternal excess [14, 19, 23]. msi1 mutants deviate somewhat from this model in producing fewer peripheral endosperm nuclei than wild-type seeds, although chalazal endosperm and nodules are still enlarged . FIS1/MEA was the first imprinted gene to be described in Arabidopsis. In endosperm, FIS1/MEA is expressed only from the maternally derived alleles, while it is biallelic in embryo, at least from torpedo stage onward [3, 5]. FIS2 is expressed only from maternal alleles in developing seeds . There is no molecular evidence for imprinting of the other FIS-class genes. The four FIS-class gene products participate in Polycomb Repressive Complex (PRC) 2 [21, 24, 25], which, like animal PRCs inhibits transcription of target genes through epigenetic modification of chromatin [26, 27]. The similarity of FIS-class mutant and lethal paternal excess phenotypes led to the proposal that one function of the wild-type FIS proteins is to repress transcription of loci in the maternally derived genome that are normally expressed only when paternally contributed . This has been supported by the discovery that the FIS1/MEA-containing PRC2 represses the maternal alleles of PHERES1 (PHE1), an imprinted gene which is preferentially expressed from the paternal genome [10, 28]. Another feature of FIS-class mutants is an 'autonomous endosperm' phenotype. Wild-type Arabidopsis embryo sacs must be fertilized before the egg or central cell will divide. In contrast, if FIS-class mutant flowers are prevented from self-pollinating, the central cell nevertheless divides and forms a syncytial structure resembling peripheral endosperm, even though there is no cellularization or regional specification [19, 21, 29, 30]. In msi1 mutants, the unfertilized egg also divides to form a small multicellular structure expressing several markers for embryogenesis . The seed-like structures produced by unfertilized FIS-class mutant ovules invariably abort. Comparison of gene expression in fertilized and unfertilized FIS-class mutants could reveal genes that are normally repressed by PRC2 in seeds. In the work presented below, we investigated gene expression underlying paternal and maternal excess phenotypes using two different microarray platforms, and also profiled fertilized and unfertilized FIS-class mutants. This project had several goals, including the identification of genes that are not necessarily imprinted, but which are nevertheless associated with promoting or inhibiting seed growth; and comparing gene expression between seeds from interploidy crosses and FIS-class mutants. Another goal was to gather molecular data to help us position fertilized and unfertilized FIS-class mutants on the maternal-paternal spectrum. We found that fertilized fis1 mutant seeds have similar transcriptional profiles to seeds with paternal excess, showing that the shared phenotypes are underpinned by similar patterns of gene expression. To learn more about regulation of seed size, we filtered our data for sets of genes strongly associated with enhanced or inhibited seed growth. Our results illustrate the molecular link between paternal excess and FIS-class mutations, and potentially provide tools for altering seed size. To explore the patterns of gene expression underlying the phenotypes of seeds generated by interploidy crosses and FIS-class mutants, we performed two independent microarray experiments using biological replicate samples and different array platforms to increase confidence in the results. Other cross-platform comparisons have been successful in Arabidopsis . For our first experiment, RNA was extracted from siliques at 5 DAP resulting from the crosses 6xX2x and 4xX2x (maternal excess), 2xX2x (balanced), 2xX4x and 2xX6x (paternal excess), and fis1/meaX2x, and hybridized to custom Agilent 22K two-dye (Cy3 and Cy5) arrays (http://www.chem.agilent.com; http://www.ceres-inc.com). For the second experiment, RNA was extracted at 5 DAP from two further independent biological samples of the crosses listed above, and also from unfertilized siliques of male-sterile msi1 mutants at 7 days after floral opening (see Methods), and hybridized to Affymetrix ATH1 full-genome chips http://www.affymetrix.com. Thus, our experiments incorporated seeds from interploidy crosses generating both viable and lethal parental imbalance, a fertilized FIS-class mutant that develops with a phenotype resembling lethal paternal excess, and an unfertilized FIS-class mutant that develops with no paternal contribution. The phenotypes of all crosses are illustrated in Figure 1. At 5 DAP, seeds with the normal balance of maternal to paternal genomes (2xX2x cross, generating a 2m:1p endosperm) typically contain a heart-stage embryo, peripheral endosperm which has begun to cellularize from the micropylar pole, a compact chalazal endosperm, and endosperm nodules (Fig. 1C). In seeds with paternal excess (2xX4x and 2xX6x) there is no cellular endosperm at this stage, and the chalazal endosperm is enlarged (Fig. 1D, E). fis1X2x seeds (Fig. 1F) likewise contain only free-nuclear endosperm, and in common with 2xX6x crosses, the endosperm never cellularizes and the seeds abort [14, 18, 33]. Fertilized fis1 mutants also produce greatly enlarged endosperm nodules. Therefore the characteristic phenotypes both of paternal excess and of a fertilized FIS-class mutant include overproliferation of endosperm and delay or failure of cellularization. 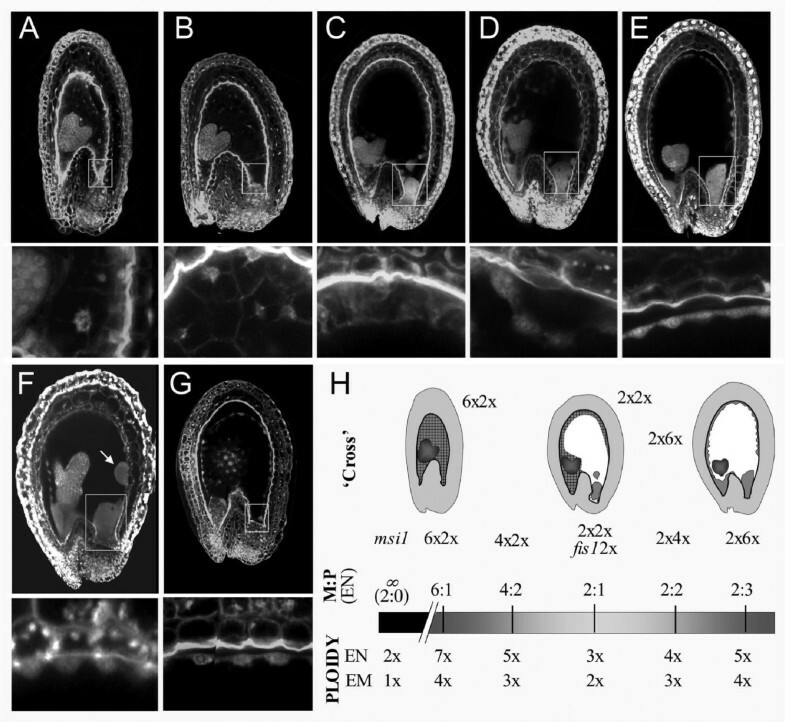 At the other end of the phenotypic spectrum, seeds with maternal excess (4xX2x and 6xX2x) produce small endosperms that cellularize precociously, and tiny chalazal endosperms with no associated nodules (Fig. 1B, A). The endosperm fails to cellularize in unfertilized msi1 mutants (Fig. 1G) but these also lack chalazal endosperm, so are difficult to classify according to endosperm growth and morphology. Phenotypes and genetic constitution of seeds used for transcriptional profiling. (A-G) Confocal micrographs of seeds at 5 days after pollination (7 days after flowering for msi1). Boxes surround the chalazal region. Below each composite seed image is an enlargement showing peripheral endosperm. Seed genotypes are: (A) 6xX2x, (B) 4xX2x, (C) 2xX2x, (D) 2xX4x, (E) 2xX6x, (F) fis1X2x, (G) msi1 (autonomous seed produced by an unfertilized msi1mutant ovule). Arrow in (F) indicates endosperm nodules. (H) Spectrum of maternal:paternal genomic balance. Above bar: ratio of maternally to paternally derived genomes in the endosperm for each 'cross' (sexual crosses + unfertilized msi1). Below bar: absolute number of genomes in endosperm (EN) and embryo (EM) for each 'cross'. Figure 1H illustrates the absolute numbers of genomes in embryo and endosperm for each seed genotype, and places each seed on a spectrum of maternal:paternal genomic balance in the endosperm. Although fis1X2x seeds contain the same number of genomes and the same genomic balance as 2xX2x, both phenotypic (endosperm overproliferation) and molecular evidence (ectopic expression of the normally repressed maternal allele of PHE1) indicates that they may be regarded as having 'virtual' paternal excess [10, 23]. Unfertilized msi1mutants contain no paternal genomes, but may also share some features of paternalization due to the mutation. RNA hybridization and statistical analysis for each microarray platform are described in the Methods. Results for the Affymetrix and Agilent experiments are available through GEO http://www.ncbi.nlm.nih.gov/geo under the accession number GSE20007. Correspondence between Affymetrix and Agilent probes was determined as described in the Methods. This yielded a list of 20,442 genes that we used in the subsequent analysis (cf. 33,518 Arabidopsis genes annotated in TAIR Release 9.0 (http://www.arabidopsis.org, ). We subtracted from this list all genes that were below a threshold of absolute expression in all samples, or which had widely differing ratios in the dye-swap experiments indicating unreliable expression (see Methods), giving a final list of 14,944 unique AtIds that were called present in at least one sample. These AtIds, along with the corresponding Agilent and Affymetrix probesets and averaged SLR and pSLR values (see Methods), are provided in Additional file 1 table S1 online. Interestingly 1,947 of the 2,608 genes predicted to be early seed specific by Day et al , were found to be present in our dataset (Additional file 1 table S1.1.). Of the genes called present in the peripheral endosperm of the Goldberg and Harada dataset http://seedgenenetwork.net/arabidopsis a similar proportion (74%) were also represented in our dataset (data not shown). This gives us the confidence that using whole siliques as the experimental material captures a significant proportion of the endosperm expressed genes. To identify genes that were over- or underexpressed ('up' or 'down') in each interploidy cross or FIS-class mutant relative to 2xX2x, we generated lists of genes with signal-log ratios (SLRs) ≥ 0.6 or ≤ -0.6, corresponding to changes in expression of approximately 50% up or down; many genes had much higher changes than this. For Affymetrix data we based the lists on p-value weighted SLRs (pSLR) to minimize interference from values for which there was little statistical evidence for differential expression (see Methods and ). Genes called up or down together with their SLRs/pSLRs are presented in Additional file 2 table S2 online. We next compared over- and underexpressed genes across platforms for each cross; for example we ultimately only called a gene up if its SLR was ≥ 0.6 in both Affymetrix and Agilent datasets. The lists of genes called up and down that were supported by both platforms are provided in Additional file 3 table S3 online. Table 1 shows the numbers of genes called up or down in each sample and platform, along with genes in common across platforms. 2xX4x crosses showed the least amount of misexpression, and 6xX2x the greatest. In fis1X2x seeds, which differ from wild-type by a premature stop codon in a single ORF , 401 genes were called up in both platforms, while in phenotypically similar 2xX6x crosses, which have triple the normal number of paternal genomes in the seed, only 288 genes were called up. This suggests that interploidy crosses provide less disturbance to gene expression than FIS-class mutations and can be a valid route to exploring imprinting. We also observed that in the interploidy crosses there was no general bias towards overexpression of genes, though the seeds all contained more genomes than 2xX2x seeds (Fig. 1). This rules out a simple relationship between gene dosage and level of gene expression, instead indicating that differential gene expression observed here in many cases represents genuine changes to developmental programmes. Cross-platform comparison of genes called up and down. The numbers of genes called up or down for each cross and each platform are shown, along with the numbers of genes in common across both platforms for each cross ('overlap'), and the percentage of the maximum possible agreement between platforms. The right-hand column shows the percentage of each list consisting of transcription factors (http://datf.cbi.pku.edu.cn; Guo et al., 2005). For all samples except for msi1 the percentage of transcription factors was calculated from the lists of genes called up or down in both platforms ('overlap'). See Additional file 2 table S2 for genes called up or down in each platform and Additional file 3 table S3 for genes called up or down in both platforms. The extent of agreement between the Affymetrix and Agilent datasets was calculated as the percentage of genes in common out of the possible maximum (Table 1). The overlap between datasets ranged between 24.6 and 55.9%; this compares favourably with the results of Pylatuik and Fobert , who recorded cross-platform overlaps of 14.3 to 25.5% between sets of Arabidopsis genes overexpressed 2.5-fold. We next investigated whether the sets of genes called up in the two crosses generating paternal excess had more in common with each other than with genes up in maternal excess, and vice versa. The results of these comparisons are represented in Figure 2. We found that datasets from phenotypically similar crosses had a higher proportion of genes in common than datasets from opposite crosses. For example, the correspondence between genes called up in 2xX4x and 2xX6x was 46% of the possible maximum (the number of genes in the smaller set, in this case 2xX4x up), although one of these crosses produces viable seeds and the other is lethal; while the overlap between genes up in 2xX4x and 4xX2x seeds, which are both viable, was only 10% of the maximum. These results also indicate that overexpression observed in these experiments is much more likely to reflect genuine changes in developmental programmes than simply the presence of extra copies of genes in seeds with increased ploidy. We next compared genes called up in fis1X2x with those up in the two lethal interploidy crosses. More than 50% of genes overexpressed in 2xX6x were also up in fis1X2x, while only 7% of genes up in 6xX2x were up in fis1X2x, supporting the hypothesis that FIS-class mutations have a paternalizing effect on seed development. Extent of agreement between sets of genes called up. The percentage shown in the region of overlap is the percentage of the maximum possible agreement for each pair. (A) Agreement between interploidy crosses generating paternal and maternal excess. (B) Agreement between fis1X2x and the two extreme interploidy crosses. We assayed gene expression at a relatively early stage since we are especially interested in identifying genes that control seed development. Nevertheless, we expected that some genes would be over- or underexpressed as a consequence of altered development rather than as a cause. To assess whether genes showing differential expression at 5 DAP could be regulators of seed development, we compared the list of 1922 transcription factors annotated in the Arabidopsis genome (http://datf.cbi.pku.edu.cn; ) with the sets of genes we called up or down. There are 27,379 protein coding genes annotated in TAIR release 9.0 http://www.arabidopsis.org. So, approximately 7.0% of the genome consists of transcription factors. A similar proportion, 8% (1,192), of the genes called present in our experiment are on the transcription factor list. However most of our up or down lists contained a higher proportion than this (Table 1). We conclude that genes controlling seed development, rather than merely responding to upstream changes, are well represented in our transcription profiles. To validate the microarray data we examined the expression of 20 genes using quantitative real-time PCR (qRT-PCR). These genes were mainly chosen because of their expression trends in the microarray data, and some will be discussed in more detail below. Results are presented in Additional file 4 table S4 online and summarized in Table 2, which shows the extent of agreement between each microarray platform and qRT-PCR for the 20 genes. Out of 220 calls tested (11 calls for each of 20 genes), microarray and qRT-PCR data gave the same call for 170 (i.e. for a particular cross and platform, a gene was called up, down, or unchanged in both the microarray and the qRT-PCR experiments), giving overall agreement of 77%. A similar level of agreement between microarray and qRT-PCR data for transcription in maize anthers was recently reported by Skibbe et al. . Where our microarray and qRT-PCR calls did not agree, the majority nevertheless had fold changes in the same direction (Additional file 4 table S4). Only one sample, 4xX2x Agilent, had less than 65% agreement with the qRT-PCR findings. None of the genes from this dataset where qRT-PCR and the Agilent data disagreed were called changed in both Agilent and Affymetrix platforms, and therefore were not included in our final list of genes called down in this cross. We conclude from our validation that the microarray data is particularly robust for genes that show the same expression trend in both platforms. Agreement of microarray and qRT-PCR data. Expression of 20 genes was tested using qRT-PCR and calls of up, down, or not changed were compared with calls for the same genes in the microarray data. Each cell shows the number (percentage) of calls that agreed out of a maximum of 20. qRT-PCR results are provided in Additional file 4 table S4. We were interested in testing whether the crosses generating paternal or maternal excess had similar expression patterns, and we also wanted to position the fertilized and unfertilized FIS-class mutants on the maternal-paternal spectrum. We used hierarchical clustering  to compare expression trends among all samples. Repeated clustering using different distance measures (see Methods) robustly showed distinct 'paternalized' and 'maternalized' transcriptome sets, where 2xX4x, 2xX6x, and fis1X2x formed the paternalized cluster and 4xX2x, 6xX2x, and parthenogenetic msi1 belonged to the maternalized cluster (Fig. 3). Principal Components Analysis of the microarrays also gave results which are consistent with the hierarchical clustering (not shown). Hierarchical clustering of gene expression data from two microarray experiments. The dendrogram indicates the degree of similarity between samples. A black bar marks the paternal cluster and a grey bar the maternal cluster. The transcriptional profile of fis1X2x crosses is most similar to the profiles of 2xX6x seeds from both platforms. This supports a model in which FIS-class mutations 'paternalize' the maternally inherited genomes in the endosperm by removing crucial maternal-specific function, so that the balance of maternal:paternal genomes is in effect more like the ratio generated by 2xX6x crosses . Although msi1 is also a FIS-class mutant, it was not pollinated for our experiment, and therefore not surprisingly had a very different transcriptional profile from fertilized fis1 seeds. msi1 clustered most closely with 6xX2x; this may reflect shared features such as near or total absence of chalazal endosperm. To determine whether categories of genes with particular biological function were associated with different seed phenotypes, we looked for GO (gene ontology) biological process terms  that were over- or underrepresented among genes showing differential expression, using the GOstat tool available at http://gostat.wehi.edu.au. We compared the list of 14,944 genes called present in the experiment (Additional file 1 table S1) with genes that were called up or down in the interploidy crosses and in fis1X2x. Selected Biological process terms that occurred with significantly enhanced or reduced frequency (P < 0.05, adjusted using the Benjamini and Hochberg correction for multiple testing) are shown in Table 3. Some terms were omitted because of redundancy. Not all up and down lists contained categories with altered frequency. Loci called down in 2xX6x and fis1X2x were enriched for genes involved in cell cycle regulation. Downregulated genes in triploid seeds have previously been found to be enriched in genes within the functional category of cell cycle regulation . This was at first surprising given the overproliferation of 2xX6x and fis1X2x endosperms, but these seeds also display aberrations in the cell cycle such as failure of endosperm cellularization. Strikingly, 44 of the genes called down in 2xX6x and 22 of the genes called down in fis1X2x are among a set of 82 Arabidopsis genes recently identified as showing an expression peak at the G2/M boundary in synchronized cell culture . Mitosis-specific genes called down in 2xX6x and/or fis1X2x include the syntaxin SYP111/KNOLLE (At1g08560); several kinesins such as HINKEL/ATNACK1 (At1g18370) and ZCF125 (At1g59540); the mitotic cyclins CYCB1;4 (At2g26760), CYCB1;3 (At3g11520), and CYCB1;2 (At5g06150); CDKB2;1 (At1g76540), a cyclin-dependent kinase involved in the G2/M transition; and the myb family transcription factor MYB3R-4 (At5g11510). SYP111/KNOLLE is expressed in mitotically dividing cells and in cellularizing endosperm, and is required for membrane vesicle fusion in the plane of cell division . Kinesins associate with microtubules and are involved in cytoskeleton organization and transport of vesicles and organelles; HIK/ATNACK1 is essential for cell plate formation during mitotic cytokinesis  and ZCF125 is involved in interactions between the spindle and the kinetochores of chromosomes . MYB3R-4 is proposed to regulate genes involved in the G2/M transition . Nearly 80% of the mitosis-specific genes downregulated in 2xX6x are also called down in 6xX2x, perhaps because cell division has ceased in seeds with lethal maternal excess by this stage. 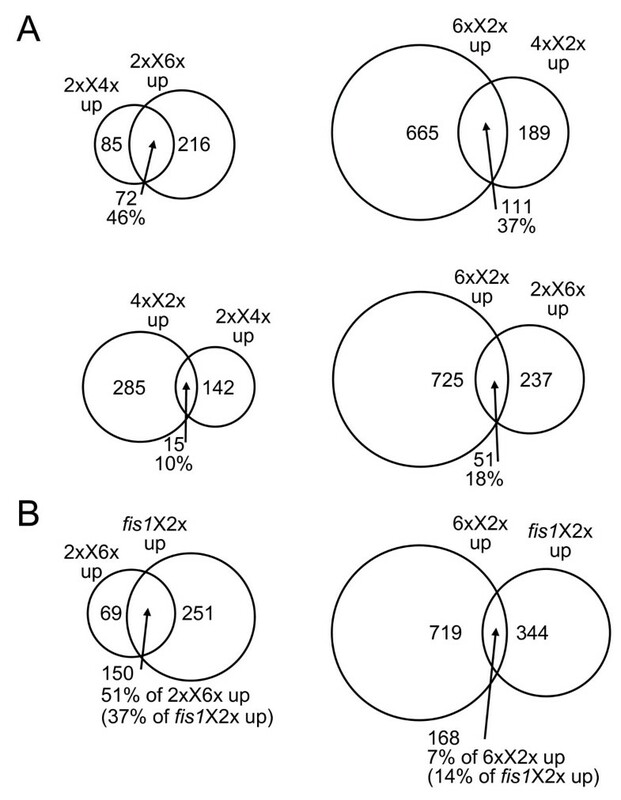 Underexpression of genes involved in DNA replication initiation in 6xX2x, is consistent with reduced division in 6xX2x. Selected GO biological process terms over- and underrepresented among genes called up and down. The GOstat tool (http://gostat.wehi.edu.au/; Beissbarth and Speed, 2004) was used to identify GO biological process terms significantly (P < 0.05) over- and underrepresented among genes called up and down. P-values were adjusted using the Benjamini and Hochberg correction for multiple testing. Each list was compared with the set of all genes called present in the experiment. n = number of genes in each list with GO biological process annotation. To learn more about factors involved in controlling seed size, we were interested in identifying the genes most strongly associated with enhanced or inhibited seed growth. To determine the genes with the most robust associations we used several filtering criteria. (1) As described above, we only called a gene up or down in interploidy crosses if this was supported in both platforms. (2) We next looked for intersections of gene sets that were up or down in crosses generating phenotypically similar seeds. For example, to find the genes strongly associated with enhanced endosperm/seed growth we chose genes overexpressed in both 2xX4x and 2xX6x crosses. (3) After identifying genes called up in seeds in one phenotypic class, we applied a further condition that those genes should not be up in the opposite class. This was to avoid false positives from genes that may have been overexpressed because of polyploidy, stress, or other causes affecting seeds irrespective of the extent of their growth. To increase the selectivity of the final lists we used broad definitions for 'not up' and 'not down': we called a gene 'not up' if the Agilent SLR and Affymetrix pSLR were both equal to or below 0.3 (corresponding to a change in expression of approximately 20%), and 'not down' if the SLRs/pSLRs were = -0.3. For example, our list of genes strongly associated with endosperm overproliferation were called 'up' in 2xX4x and 2xX6x, and also 'not up' in 4xX2x and 6xX2x. The lists of seed class-associated genes, along with annotations and GO biological process terms (http://www.arabidopsis.org; ), are presented in Additional file 5 table 5 online. The first group (Additional file 5 table S5, S5.1-3) comprises lists of 'large seed genes' (we have used 'large seeds' as a shorthand for seeds with increased endosperm proliferation, even though in lethal crosses these seeds are only large while they are still alive). These genes are positively associated with large seeds (up in combinations of 2xX4x, 2xX6x, and fis1X2x, not up in 4xX2x and 6xX2x), or negatively associated with small seeds (down in combinations of 4xX2x, 6xX2x, and msi1, and not down in 2xX4x and 2xX6x). We considered genes up in 2xX4x and 2xX6x and not up in 4xX2x and 6xX2x to be particularly strongly associated with promoting or responding to seed growth; these are shown in Table 4. The second group (Additional file 5 table S5, S5.4-6) contains lists of 'small seed genes', which are positively associated with small seeds (up in combinations of 4xX2x, 6xX2x, and msi1, and not up in 2xX4x and 2xX6x) or negatively associated with large seeds (down in 2xX4x or in 2xX6x and fis1X2x, not down in 4xX2x and 6xX2x). Genes up in 4xX2x and 6xX2x and not up in 2xX4x and 2xX6x are shown in Table 6. We also constructed a list of genes called up in the two FIS-class mutants (Additional file 5 table S5, S5.7) (up in fis1X2x and msi1), to identify genes overexpressed in both fertilized and unfertilized seeds with impaired function of the PRC2 that contains FIS1/MEA and MSI1. Genes called up in 2xX4x and 2xX6x, not up in 4xX2x and 6xX2x. Up = (SLR/pSLR ≥ 0.6), not up = (SLR/pSLR (≤ 0.3). GO annotations were obtained from TAIR (http://www.arabidopsis.org/tools/bulk/go/index.jsp; Berardini et al., 2004). GO function terms are provided where no biological process terms were annotated. There were 114 genes called up in 2xX4x but not up in crosses generating maternal excess (Additional file 5 table S5, S5.1). More than half (62) were also up in 2xX6x (Table 4), and all but ten of these were likewise overexpressed in fis1X2x. This underlines the similarities in transcription profiles not only between interploidy crosses generating different degrees of paternal excess, but between these and fis1 mutant seeds. Ninety-five genes were up in 2xX6x and fis1X2x but not 4xX2x and 6xX2x (Additional file 5 table S5, S5.2), of which 43 were not also up in 2xX4x, and therefore associated with an extreme paternal excess phenotype. Finally there were 158 genes called down in 4xX2x but not down in 2xX4x and 2xX6x (Additional file 5 table S5, S5.3), including 52 also down in 6xX2x, and 32 down in 4xX2x, 6xX2x, and msi1. Twelve genes were up in 2xX4x, 2xX6x, and fis1X2x and also down in 4xX2x and 6xX2x (Table 4), indicating especially strong positive association with seed growth. MADS-box genes are involved in many aspects of plant development, including essential roles in reproduction such as specification of floral organ identity, and regulatory roles during seed and fruit development . Strikingly, a set of co-regulated and interacting MADS-box transcription factors  are associated with large seeds. The Arabidopsis interactome  visualized through the interaction viewer http://bbc.botany.utoronto.ca/interactions/ shows the interactions between these MADS box proteins (Figure 4). Similar shared functions of the AGAMOUS-LIKE gene clusters have been demonstrated in early endosperm development and have been implicated in interspecific incompatibility [50, 51]. These notably include PHE1 (At1g65330) and its close homologue PHE2 (At1g65300), which are both overexpressed in 2xX4x, 2xX6x, and fis1X2x. PHE1 was previously identified as overexpressed in fis1/mea mutants in a microarray experiment performed on younger seeds than we used here . PHE1 and PHE2 share the same Affymetrix probeset and therefore either transcript may have been responsible for the signal. The Agilent array contains separate probes for these two genes but due to sequence similarity, cross-hybridization was still a possibility. However qRT-PCR using gene-specific primers gave similar expression profiles for both genes (Additional file 4 table S4), indicating that both PHE1 and PHE2 are likely to be upregulated in seeds with paternal excess or a paternalizing fis1X2x mutation. This scenario is supported by the observation that PHE1 expression is repressed by FIS1/MEA, an inhibitor of proliferation . In our microarray data, the MADS-box genes AGL28 (At1g01530) and AGL40 (At4g36950) were called up in one or more of 2xX4x, 2xX6x, or fis1X2x, while our qRT-PCR data showed both genes were overexpressed in all three large seed genotypes (Additional file 4 table S4). These MADS-box genes are co-expressed with PHE1, and their products interact with the PHE1 and PHE2 proteins in yeast two-hybrid assays . We also tested AGL62 (At5g60440) as it was likewise reported to interact with the PHE proteins, and called up in 2xX6x and fis1X2x; qRT-PCR showed this gene is upregulated in 2xX4x, 2xX6x, and fis1X2x but not up in 4xX2x or 6xX2x. Several seed defects leading to abortion were observed in agl62 seeds. These seeds have a low number of endosperm nuclei and exhibit precocious endosperm cellularization as well as embryo defects (; unpublished data Bouariky and Tiwari). A further MADS-box gene called up in all three large seed samples, AGL45 (At3g05860), encodes a protein reported to interact with AGL40. Interaction map for the AGLs overexpressed in 'big seeds'. Big blue circles represent the 5 AGLs overexpressed in the 2 × 6 and fis1X2x crosses. It is interesting to observe that the MADS box proteins interact in different complexes in different backgrounds to regulate endosperm development; AGL 62- AGL80 for endosperm development (Kang et al., 2008), AGL80-AGL61 for central cell development  and AGL62-AGL90 endosperm rescue overcoming post zygotic barrier in A thaliana × A arenosa crosses . Hence the overexpressed AGLs in our dataset may very well interact as higher order complexes to regulate endosperm development in the interploidy crosses and/or be part of a transcriptional cascade promoting seed growth. Overexpression of individual genes e.g., AGL28, PHE1, AGL40 under the endosperm specific promoter of At5g46950  did not result in any significant change in seed size, overexpression of PHE2 under the same promoter however yielded slightly heavier seeds (unpublished data Tiwari et al). This might indicate that two or more members need to be overexpressed for a visible phenotype. Further experiments such as study of mutants of one or more members of the complex are required to investigate whether upregulation of these MADS-box genes is a cause or a consequence of enhanced seed growth. PHE1 is preferentially expressed in endosperm from the paternal allele only, and therefore its expression trend in our data was as expected. We were surprised however to find an oppositely imprinted gene, FWA (At4g25530), also called up in 2xX4x, 2xX6x, and fis1X2x. FWA is a homeodomain transcription factor that is expressed only in endosperm, and only from the maternal alleles [4, 54]. Therefore we expected FWA to show a complementary expression trend to PHE1, i.e. up in 4xX2x and 6xX2x, but not up in paternal excess crosses. Our qRT-PCR data for FWA supports our microarray data for large seeds and additionally calls FWA down in 4xX2x, 6xX2x, and msi1 (Additional file 4 table S4), indicating the microarry data revealed a bona fide expression trend. One possibility to be tested is whether FWA expression might be deregulated in a background of parental imbalance, so that it becomes expressed from paternal alleles, or in the embryo, or both. It was recently reported that PHE1 loses imprinting in interspecific crosses between A. thaliana and A. arenosa that also generate paternal excess, becoming ectopically expressed from maternal alleles . Another imprinted gene MPC which is paternally imprinted , also shows an upregulation in the 2xX6x, and fis1X2x crosses but is unchanged compared to the balanced cross (2xX2x) in the 4xX2x and 6xX2x. It will be interesting to determine whether both FWA and MPC are deregulated in the case of paternal imbalance. The transcription factor WRKY10/MINISEED3 (MINI3) (At1g55600), up in 2xX6x and fis1X2x, also has a known role in seed growth. qRT-PCR confirmed our microarray data and in addition returned an up call for 2xX4x and a down call for 6xX2x (Additional file 4 table S4). This expression trend supports a previously reported role for MINI3 in promoting endosperm growth, based on the observation that loss-of-function mini3 mutants produce small seeds with small endosperms that cellularize early . Although paternalized seeds display increased and prolonged endosperm proliferation, and delayed or inhibited cytokinesis, few core cell cycle genes were overexpressed in large seeds. The exceptions included two D cyclins, CYCD4;1 (At5g65420) and CYCD4;2 (At5g10440). The former was called up in 2xX6x and fis1X2x, and the latter was up in all three large seed crosses but not in maternal excess. qRT-PCR confirmed the microarray data for large seeds for both genes, and additionally strengthened the association of CYCD4;2 with seed growth by showing it is downregulated in 4xX2x and 6xX2x (Additional file 4 table S4). D cyclins are involved in the G1 to S transition and respond to signals such as cytokinin and sucrose . CYCD4;1 was found to be rate-limiting for cell division in germinating seeds . CYCD4;2 has previously been reported to lack the Rb-binding motif and PEST sequence of other D cyclins, but functional assays show it likewise has a role in proliferation . To our knowledge CYCD4;2 is absent or shows extremely low expression in other microarray experiments http://www.genevestigator.ethz.ch and therefore its strong association with seed growth here makes it an interesting candidate for control of cell proliferation in developing seeds. DEL2/E2Fd/E2L1 (At5g14960), encoding an atpyical E2F, was called up in 2xX4x and 2xX6x, and down in maternal excess and msi1; qRT-PCR indicated a similar trend although comparatively lower upregulation in 2 × 4 (Additional file 4 table S4). Typical E2F proteins heterodimerize with DP proteins to bind E2F sites in promoters of genes associated with DNA synthesis and replication and cell cycle control, including D cyclins, and may be positive or negative regulators of cell division. In contrast, atypical E2Fs bind E2F sites as monomers and repress E2F-regulated promoters [60, 61]. The function of DEL2/E2Fd has not yet been described. Consistent with increased cell proliferation in seeds with paternal excess and inhibited proliferation in maternalized seeds, many genes involved in DNA replication, chromatin organization, RNA translation, or protein synthesis were overexpressed in large seeds and/or down in small seeds. These included histones (Histone H3, At1g09200; Histone H4, At5g59690), genes involved in chromatin modification (SUVH7, At1g17770; FAS1, At1g65470; SDG21/SUVH8, At2g24740), and members of the Origin of Replication complex (ATORC2, At2g37560; ATORC1a, At4g14700). SUVH7 and SDG21/SUVH8 are related to animal Su(var)3-9 proteins, which affect chromatin packaging through histone methylation , while FAS1 is required for heterochromatin formation . Seeds mutant for ATORC2 undergo very few endosperm or embryo divisions before arresting, indicating that this gene is essential for cell proliferation in the seed ; downregulation of ATORC2 in 4xX2x is consistent with this role. In contrast ATORC1a may be involved in endoreduplication rather than proliferation . Although endoreduplication is not a prominent feature of Arabidopsis endosperm as in maize, there is some evidence for endoreduplication in chalazal endosperm [66, 67]. ATORC1a was called down in both 4xX2x and 6xX2x seeds, and this could be a factor in the suppression of peripheral endosperm cell division or of chalazal endosperm growth observed in seeds with maternal excess. We observed differential expression of many genes involved in metabolism or signalling of the hormones cytokinin, gibberellin, brassinosteroid, and auxin. According to our microarray data the cytokinin oxidase CKX2 (At2g19500) is up in 2xX6x and fis1X2x; this was confirmed by qRT-PCR (Additional file 4 table S4), which also indicated overexpression in 2xX4x and msi1 and underexpression in 4xX2x crosses. This pattern was at first surprising as cytokinin oxidases catalyse the irreversible degradation of cytokinin, which is associated with cell proliferation. However, recent work shows that CKX overexpression increases seed size in Arabidopsis to a greater extent than can be completely accounted for by the accompanying loss of fertility . Gibberellic acid (GA) is known to be required for seed germination but there is also evidence that it is essential for seed growth . Several genes involved in GA metabolism or response were upregulated in large seeds: these included GA1 (At4g02780), encoding a copalyl diphosphate synthase that catalyses the first committed step in GA biosynthesis, At1g44090, encoding a member of the GA 20-oxidase family that catalyses synthesis of bioactive GA, and At2g30810, a GA-regulated family protein. This last gene had a particularly strong association with seed growth, showing very high levels of overexpression both in microarray data and in qRT-PCR--according to the latter, 18-fold in 2xX4x, 69-fold in 2xX6x, and 30-fold in fis1X2x--and severe underexpression in 4xX2x, 6xX2x, and msi1. Other microarray experiments show this gene is highly expressed in siliques and also present in isolated seeds http://www.genevestigator.ethz.ch, but no function has been reported. Brassinosteroids (BRs) promote cell growth and division, and are most abundant in pollen and immature seeds . Genes involved in BR synthesis or response that were up in large seeds or down in small seeds included BSU1 (At1g03445), encoding a serine threonine phosphatase preferentially expressed in elongating cells which is involved in response to BRs ; and DWF4 (At3g50660), whose product catalyses a rate-limiting step in BR synthesis . Further genes involved in hormone metabolism and function are annotated on the lists in Additional file 5 table S5, S5.1-3. Seeds with maternal excess are characterized by a small seed cavity, inhibited proliferation and early cellularization of endosperm, small chalazal endosperm, and absence of endosperm nodules. One hundred-nineteen genes were overexpressed in 4xX2x but not in 2xX4x and 2xX6x, and of these 31 were also up in 6xX2x, and 16 in msi1 as well (Table 5 and Additional file 5 table S5, S5.4). Unfertilized msi1 seeds have no chalazal endosperm or nodules, and fewer endosperm nuclei than a fertilized FIS-class mutant would produce, but in contrast to seeds with maternal excess, the seed cavity is not notably small in parthenogenetic msi1, endosperm fails to cellularize, and embryo development is very limited. Therefore it is not surprising that there was less overlap between the transcriptional profiles of msi1 and seeds with maternal excess than there was between fertilized fis1 and seeds with paternal excess. Twelve genes were called down in 2xX4x but not 4xX2x and 6xX2x (Additional file 5 table S5, S5.5), and 14 genes were called down in 2xX6x and fis1X2x (Additional file 5 table S5, S5.6). Genes called up in 4xX2x and 6xX2x, not up in 2xX4x and 2xX6x. GO function terms are provided where no biological process terms were annotated. Few of the genes positively associated with small seeds had an obvious link to their phenotype, suggesting that seed growth is more likely to be restricted by downregulation than overexpression of key genes. 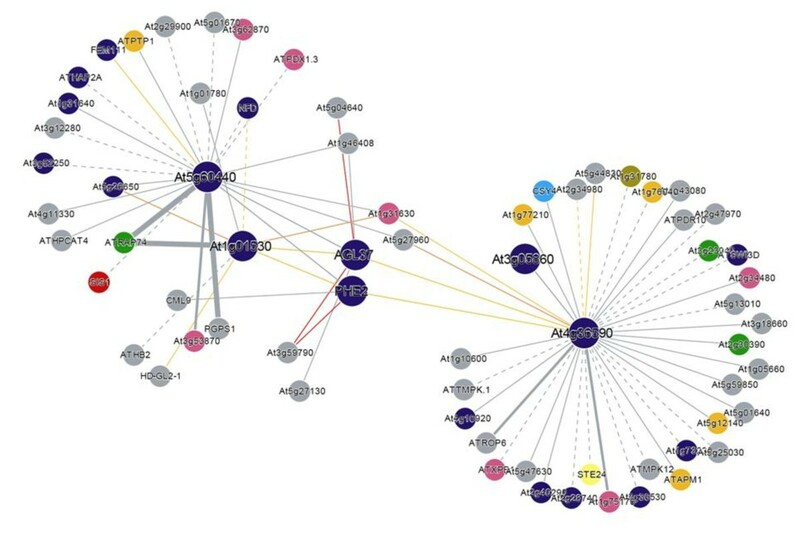 Several genes involved in auxin function were associated with small seeds, including the auxin response factor ARF5/MP (At1g19850), up in 4xX2x, 6xX2x, and msi1, which is involved in embryonic patterning and cell expansion , and CYP711A1/MAX1 (At2g26170), also up in maternal excess and msi1. MAX genes regulate auxin transport capacity by regulating abundance of PIN auxin efflux carrier proteins ; it is interesting in this context that PIN4, which is upregulated in max1 mutants [74, 75], is also downregulated in 4xX2x crosses. It was surprising to find CYCD3;3 (At3g50070) downregulated in 2xX6x and fis1X2x, as this has a similar expression pattern during seed germination to CYCD4;1 , which is up in these crosses (see above); this could reflect different roles for these D cyclins during earlier seed development. Genes overexpressed in both fis1X2x and msi1 (165 genes, Additional file 5 table S5, S5.7) could include some that are deregulated by FIS-class mutations and involved in the overproliferation of fis mutant endosperms. This is supported by the appearance of PHE1 in this list, which is controlled by the FIS1- and MSI1-containing PRC2; overexpression of this gene in unfertilized msi1 seeds is particularly striking as they contain no paternally contributed alleles, which normally contribute the great majority of PHE1 expression. Similarly, ectopic expression of PHE1 was reported in unfertilized fis3/fie seeds . Further candidate growth-promoting genes overexpressed in fis1X2x and msi1 are the transcription factors PHE2, AGL45, and AGL62, all discussed above. Other upregulated genes that could be involved in the ectopic seed growth observed in fis mutants include the MADS box genes AGL35 (At5g26630) and AGL73 (At5g38620); ATGA3OX4 (At1g80330), encoding a gibberellin 3-oxidase preferentially expressed in flowers and siliques that catalyses synthesis of bioactive GA ; and CPD (At5g05690), involved in brassinosteroid synthesis. Reciprocal interploidy crosses in plants often give complementary seed phenotypes, but little is known about the alterations to transcriptional programmes responsible for this. Here we investigated gene expression underlying the differential development of seeds with paternal or maternal excess. One explanation for interploidy cross phenotypes is that they disrupt the balance of active copies of imprinted genes in the seed. Mutations in FIS-class genes also disrupt imprinting, and fertilized seeds of FIS-class mutants resemble interploidy seeds with lethal paternal excess, while unfertilized FIS-class mutant seeds develop autonomously with no paternal contribution, and have phenotypic attributes of both paternal and maternal excess. Therefore we also profiled fertilized and unfertilized FIS-class mutants to test their transcriptional profiles against seeds with parental genomic imbalance, and to identify genes deregulated by impairment of PRC2 function. Hierarchical clustering and comparison of genes called differentially expressed placed fis1X2x seeds in the same group as seeds with paternal excess, showing that the similar phenotypes are indeed underpinned by similar patterns of gene expression. Figure 5A is a schematic diagram of a composite seed summarizing the main features of maternal and paternal excess, and placing the interploidy and fis1X2x crosses on the maternal:paternal spectrum based on their transcriptional profiles as described above. msi1 autonomous seeds cluster with maternal excess but also show many differences, which may be due to the paternalizing effect of the FIS-class mutation as well as lack of fertilization, and therefore its position on the spectrum is less certain. To learn more about regulation of seed size, we filtered our data for sets of genes strongly associated with enhanced or inhibited seed growth. Genes overexpressed in large seeds but not in small seeds included many candidates for factors controlling seed growth, such as a group of MADS-box transcription factors encoding interacting proteins (Fig. 5B), cell cycle genes, and genes involved in hormone pathways. Some of these genes are also overexpressed in unfertilized FIS-class mutants, suggesting particularly strong association with endosperm proliferation. It would be interesting to study whether any methylation differences that exist between genes in the different interploidy crosses contribute towards the imbalance of imprinted gene expression. Methylation asymmetry has been correlated with the monoallelic expression pattern of imprinted genes in the endosperm and with differences in the expression of genes in the embryo and endosperm in both wildtype as well as dme mutant seeds [77, 78]. It would also be of interest to look closely at the maternally derived PolIV dependent si-RNAs  and the expression pattern of targets of those si-RNAs or progenitors in the interploidy crosses. The work presented here is therefore a step towards understanding the related phenomena of parental genome balance and imprinting. Relationship between phenotype and gene expression resulting from interploidy crosses and the fis1 mutation. (A) Composite seed showing the major phenotypic characteristics of maternal and paternal excess crosses. Cellularization/differentiation of endosperm proceeds from the micropylar ('maternal') to chalazal ('paternal') pole, occurring precociously in maternal excess and late or never in paternal excess. Chz = chalazal endosperm, PE = peripheral endosperm. Transcriptional profiling shows that fis1X2x seeds are strongly similar to extreme paternal excess in gene expression as well as phenotype. (B) PHE1 and other MADS-box transcription factors that encode interacting proteins are upregulated in paternal excess/fis1 and down or unchanged in maternal excess. Therefore these are strong candidates for key regulators of the interploidy cross phenotypes. The following stocks were used: C24 diploid (2×) hemizygous for an A9-barnase transgene which confers male sterility , C24 tetraploid (4×) A9-barnase, Col-1 hexaploid (6×), fis1-3 homozygous mutants (= mea-3/f644, ) in the Ler accession, and msi1-2 homozygous mutants  in C24. A9-barnase hemizygotes produce male sterile and fertile segregants, which were used as seed and pollen parents respectively in manual pollinations. 6× Col was emasculated two days before pollination to produce the 6xX2x cross. Siliques were harvested at 5 DAP and pooled from at least five plants per cross. For 2xX2x and interploidy crosses, siliques at 5 DAP had a mean length of 1.57 cm ± sem 0.02 with no significant differences among crosses (not shown). fis1X2x siliques had somewhat reduced length (1.29 ± 0.04), as Ler seed parents produce short, blunt siliques. Homozygous msi1 mutants were crossed with 2× C24 A9-barnase, and male sterile plants in the F1 were scored for presence of the msi1 mutant allele on the ability of their pistils to elongate without pollination. msi1 siliques were harvested at 7 DAF (days after flower opening), which microscopic inspection suggested was comparable to the 5 DAP stage of a balanced cross. msi1 rather than fis1 mutants were used to generate autonomous seeds as msi1 has a much higher penetrance of autonomous endosperm development . Total RNA was extracted from whole siliques of 2xX2x (control cross), 2xX4x, 4xX2x, 2xX6x, and 6xX2x (interploidy crosses), and fis1X2x crosses at 5 DAP (two biological replicates of each), and unfertilized msi1 siliques at 7 DAF, using an RNeasy Plant Mini Kit (Qiagen), concentrated using an RNeasy MinElute Cleanup Kit (Qiagen), and hybridized to Affymetrix ATH1 Genome Arrays http://www.affymetrix.com at the NASC (Nottingham Arabidopsis Stock Centre) microarray facility (affymetrix.arabidopsis.info). An ATH1 array contains 22,746 distinct non-control oligonucleotide probe sets representing approximately 24,000 genes. At the probe level, the arrays were analysed using Affymetrix GCOS (MASv5). For a detailed description of the MASv5 algorithm see Affymetrix' Statistical Algorithms Description Document http://www.affymetrix.com/support/technical/whitepapers/sadd_whitepaper.pdf. A brief summary can be found in Schulz et al. . Using the pairwise comparative variant of the algorithm, each of the eleven experimental samples (two replicates each of four interploidy crosses and fis1X2x, and one sample of unfertilized msi1) was compared to both biological replicates of the control sample (2xX2x). For each probe set, this analysis yielded a signal log2-ratio (SLR) as a measure of the degree of differential expression between the two samples and a change P-value as a measure of confidence in the expression difference. Each interploidy cross, fis1X2x, and unfertilized msi1 was compared with both replicates of the control 2xX2x cross, resulting in four SLR values for all experiments with biological replicates and two SLR values for msi1. Each Affymetrix probe set is synonymous for ten P-values and SLRs, one for each array comparison (interploidy or msi1 versus 2xX2x). To simplify the subsequent analyses, P-value and SLR were combined into a single value pSLR = SLR/(1 + e(2P - .1)/.01)), separately for each array comparison. For P-values close to 0 or 1 that correspond to high statistical confidence in the measured differential expression, the pSLR is essentially identical to the SLR. However, with decreasing statistical confidence, pSLR quickly approaches zero, shrinking large SLRs (both negative and positive) with little supporting statistical evidence for differential expression so that their unreliable and hence, deceptively large values do not interfere with the subsequent analyses. This method has been shown to be a more accurate measure of differential expression than SLR or P-value in isolation . The four pSLR values for each interploidy cross and fis1X2x from the four-way comparison were averaged, resulting in a single pSLR for each. The two pSLR values for msi1 were also averaged. mRNA was extracted from whole siliques of 2xX2x and interploidy crosses as above, and fis1X2x crosses, using a hot borate method for total RNA extraction  and an Oligotex mRNA Midi Kit (Qiagen) to isolate mRNA, and prepared for hybridization to custom Agilent 22K two-dye (Cy3 and Cy5) arrays http://www.chem.agilent.com, each carrying 27,402 non-control 60-mer oligonucleotide probes designed by Ceres, Inc. http://www.ceres-inc.com. For each experimental cross (interploidy or fis1X2x), one array was hybridized using a Cy3-labeled sample together with a Cy5-labeled 2xX2x control cross sample using Agilent standard operating protocols. The dyes were then swapped and the experiment repeated on a second array. Each array produced two expression measurements per probe: sij for the control sample and s'ij for the experimental sample where i and j identify array and probe, respectively. All subsequent analyses were based on the log2-ratios, log2(s'ij/sij), of these values. The ratios from the dye swap experiments were averaged to give a single SLR per probe per cross. The 28,952 cDNA sequences in the ATH1 database (release 5) were searched for exact matches to the 25-mer perfect match (PM) probes on the ATH1 array (277,042 exact PM probe matches). Each Affymetrix probe set contains 11 PM probes. An Affymetrix probe set was considered to match an ATH1 cDNA if 9 out of its 11 PM probes generated exact matches to the cDNA (22,415 probe set matches). The Ceres 60-mer probes were aligned to the ATH1 cDNAs using BLAT (fastMap option) . Only alignments for which Q = number of matches/60 = 5/6 were considered a match, leading to a total of 26,440 matches. Per distinct transcript ('AtId') in the ATH1 database, only the best sense match to the latest version of the transcript was retained, leaving 22,961 matches. In addition, the Ceres probes were directly aligned to the target sequences of the Affymetrix probe sets using BLAT as above, producing an additional 6,983 matches. An Affymetrix probe set and a Ceres probe were then considered to correspond to each other if they matched the same transcript or each other. 20,442 distinct pairs composed of an Affymetrix probe set and a Ceres probe fulfilled this condition. An Affymetrix probe set and its corresponding Ceres probe had to meet the following preconditions on measured absolute and differential expression in order to be included in the subsequent analysis stages. The sum of a Ceres probe's Cy3 and Cy5 signals had to exceed 50 in both dye-swap experiments for at least one cross, which excludes unreliable measurements due to low expression. A similar precondition was applied to Affymetrix probe sets. Specifically, probe sets that were called absent by GCOS (detection P-value > 0.06) on both the balanced cross and all the interploidy and msi1 arrays were excluded. These preconditions were met by 15,134 Affymetrix probe sets and their corresponding Ceres probes, which corresponded to 14,944 unique AtIds. Data filtering was performed using Microsoft Access. A gene was called up- or down-regulated compared to the balanced 2xX2x cross if it's SLR (Agilent) or pSLR (Affymetrix) was ≥0.6 or ≤-0.6 respectively. This corresponds to a change in expression of approximately 50%. After initial analysis, we only called a gene up or down if these criteria were fulfilled in both platforms. A gene called 'not up' had an SLR and pSLR of ≤ 0.3 (expression change of approximately 20%), and a gene called 'not down' had an SLR and pSLR of ≥ -0.3. Expression data from both Agilent and Affymetrix experiments were loaded into TIGR Mev . A 50% variance filter was applied to the dataset and hierarchical clustering was performed using the Pearson Correlation distance metric and the complete linkage method. To check the robustness of the clusters, clustering of samples was repeated with the Covariance and Cosine correlation distance metrics. Principal Component Analysis of the samples  was also done in Mev using the default covariance metric and number of neighbours for KNN imputation value of 10. Crosses were performed and siliques harvested as for microarray experiments (above). Total RNA was extracted from whole siliques using an RNeasy Mini Kit (Qiagen) and subjected to an on-column DNase treatment and a further in-solution DNase treatment. Extracted RNA was further purified and concentrated using an RNeasy MinElute Cleanup Kit (Qiagen) following manufacturer's instructions. Total RNA was quantified using a spectrophotometer (WPA Lightwave) and integrity checked by gel electrophoresis. Primers were designed and checked for secondary structures, hairpins and dimers using NetPrimer (Premier Biosoft International). A standard RT-PCR was done using the primers, and amplification of a single product and absence of primer dimers was verified by standard gel electrophoresis. qRT-PCR was performed using a Superscript III Platinum Two Step qRT-PCR Kit (Invitrogen). Briefly 1 μg of total RNA was used along with oligo dt and random primers and first strand cDNA synthesis was done at 46°C for 90 min. The synthesized cDNA was treated with RNaseH. Different dilutions of the cDNA (1:10, 1:20, 1:30, and 1:50) were prepared and 2 μl of each dilution were used in a PCR reaction. Primers and annealing temperatures are shown in Additional file 6 table 6 online. Four genes were tested for suitability as controls for constant expression across all the samples. These were At1g13440 (GAPDH), At3g04120 (GAPC), At3g18780 (Actin2), and At5g44200 (CBP20). Of these GAPC was found to have the most consistent expression and was used as a control for normalizing differential transcription efficiency and RNA amounts. Real-time PCR was done on a DNA Engine Opticon 2 (Bio-Rad). Typical cycling conditions were 95°C for 8 min followed by 45 cycles of 95°C for 15 sec, annealing temp X (see Additional file 6 table 6) for 15 sec, 72°C for 20 sec; plate read after each cycle; melting curve 38-98°C read every 0.5°C hold for 6 sec. Opticon 2 software calculates the reaction efficiencies without the need of a standard curve (Opticon 2 manual). The efficiencies were used to calculate the relative expression levels of the candidate genes in the experimental samples (siliques from interploidy crosses, fis1x2x or unpollinated msi1) compared to the control sample (2xX2x) at 5 DAP using the pffafl equation  where Ratio = (Efficiency Target)ΔCT target (2xX2x-experimental sample)/(Efficiency Ref)ΔCT ref (2xX2x-experimental sample). Amplification of a single product was verified by a melting curve at the end of the reaction. Two to nine reactions were run per sample, depending on the variability observed, and averaged to obtain a mean expression level. Agilent and Affymetrix microarray data have been desposited in the GEO public repository http://www.ncbi.nlm.nih.gov/projects/geo/ under the accession numbers GSE20007. We thank Rinke Vinkenoog for preparation of materials for the Agilent microarray work, Marga Frontera for advice on qRT-PCR, Robert Fischer for fis1-3 mutants, Fred Berger for msi1-2 mutants, Eric van der Graff for 4× C24, and the Ohio Arabidopsis Stock Centre for 6× Col. This work was supported by BBSRC (grant no. BBSB05532) and Ceres, Inc. The author responsible for distribution of materials integral to the findings presented in this article in accordance with the policy described in the Instructions for Authors http://www.biomedcentral.com/bmcplantbiol/ifora/is: Rod J. Scottbssrjs@bath.ac.uk. ST carried out all the RNA extractions, prepared samples for Affymetrix microarray work, and all of the qRT PCR work. She also performed the downstream data analysis as well as helped prepare the manuscript. RS has processed the raw microarray data and done the normalisations and the statistical calculations. MS and RJS have prepared the manuscript as well as helped design the experimental programme and gave intellectual guidance. RP and group (AS, KZ) have performed the Agilent microarray experiment and provided the raw data. RO and GK have given intellectual inputs to the programme. All authors have read and approved the final manuscript.